Performance and style hit the grass running with the Z200 series of zero-turn mowers. 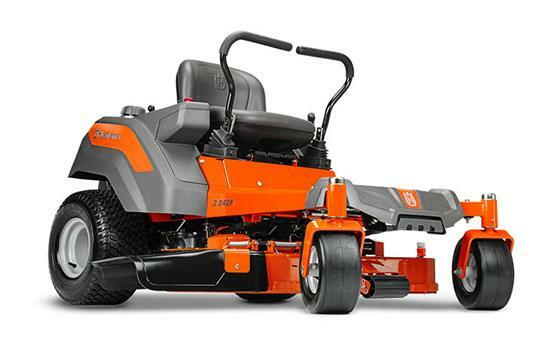 The Z242F mower is perfect for homeowners who want a superior turf cutting experience. Thanks to a powerful and reliable Kawasaki engine, this mower is ready for fast and reliable operation. CLEARCUT™ FABRICATED CUTTING DECK: The new fabricated design features welded 10 gauge steel construction with additional welded reinforcement strips for maximum durability. BUMPER: The integrated front guard/ bumper offers bold styling while protecting the nose of the unit. An optional bright LED headlight kit can easily be added, providing improved visibility in dark conditions. REFINEMENT : Rubber bellows offer a refined look and prevent debris and moisture from entering the control system. Mowing Height Range 1.5 - 4 in. Fuel Tank Capacity 3.5 gal.